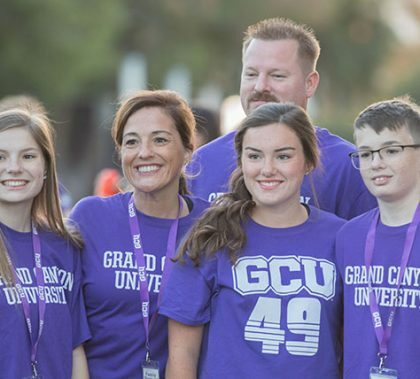 The largest Family Weekend in GCU history runs Friday through Sunday and is chock full of activities. Here is a partial list: Chapel, performances of Macbeth, competitive and casual golf at the GCU Golf Course, Parent Hospitality in Thunder Alley, a showing of “Incredibles2” on the Grove Lawn, performances by students from the College of Fine Arts and Production, performances by Spirit teams, competitive games or matches by the softball, men’s soccer, women’s volleyball, men’s and women’s swimming teams, a Thunder Bolt shopping spree, family sand volleyball and a family service project. 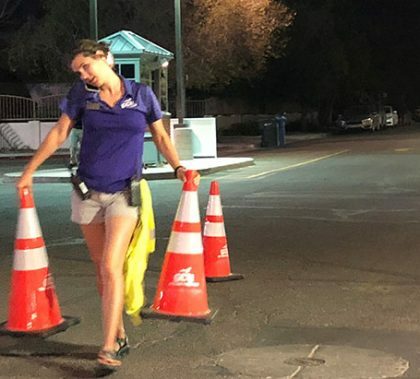 How do thousands of GCU students and their families make their way in cars, vans and U-Hauls from the perimeter of campus to their well-appointed residence hall rooms? Thousands of volunteers welcome them and move them in under the direction of Charity Norman, Director of Welcome Programs. GCU senior writer Theresa Smith embedded with Norman on Tuesday. One day earlier, she was shadowed by a video crew. Here’s a behind-the-scenes look at Move-In.